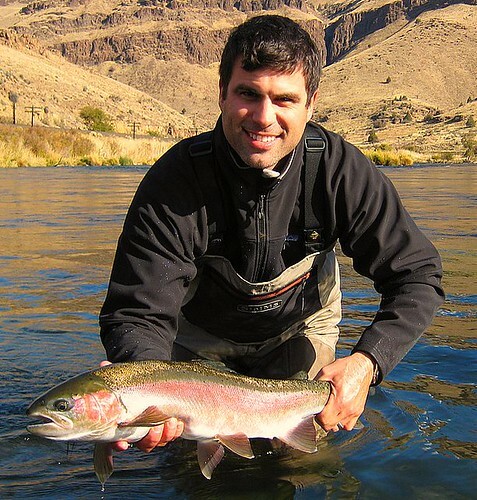 The lower Deschutes River is, without a doubt, Oregon’s most productive trout stream, and is also host to a healthy run of summer steelhead. 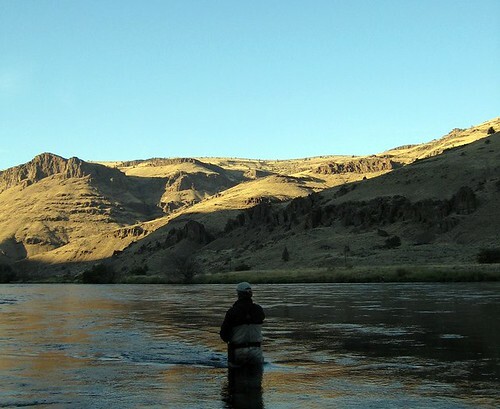 Though the headwaters of the Deschutes are high in the Cascade mountains, the blue-ribbon fishing on the Deschutes begins below Lake Billy Chinook and Lake Simtustus where the waters of the Middle Deschutes, Crooked, and Metolius Rivers combine. Downstream of Pelton Dam, just North of the town of Madras, the Deschutes slides deep into a rim rock canyon that the river has carved over the millenia into layers of basalt deposited by successive volcanic eruptions. This is desert country, and starkly beautiful; expansive vistas punctuated by sagebrush and juniper trees are juxtaposed against the verdant green of alders, willows, and cottonwoods along the river’s banks. The river’s native rainbow trout, locally known as redsides or redbands, are truly endemic, having evolved in their desert environment into a subspecies different from the rainbows you will find anywhere else. These fish average 13″-17″, fight extremely hard, and are almost invariably well-fed. The Deschutes Redside is one of the hardest fighting trout you will encounter; it is not uncommon to get a good look at your backing when you tie into one of these fish. The Deschutes is a very productive stream, and hosts abundant hatches of all the major semi-aquatic insects. 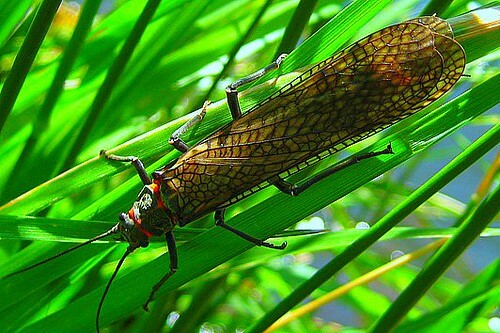 The first major hatch of the year is the salmonfly hatch. This hatch is actually two hatches in one: the salmonflies and golden stoneflies simultaneously grace the river with their presence and kick the dry fly fishing into high gear. These giant stoneflies begin migrating toward the bank to emerge sometime in early May, and the hatch generally continues through the first week of June. This hatch is a spectacle, something every fly angler should experience, and makes for some of the most exciting trout fishing of the year. As the salmonfly hatch tapers off, various smaller bugs take center stage. Throughout the summer and fall months, various species of small caddis and mayflies hatch daily, and the fish tend to move into slower water to feed on these prolific hatches. 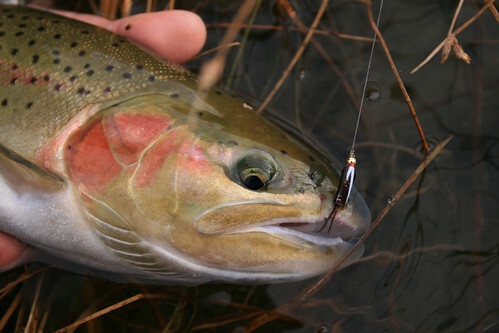 Throughout the summer months, we spend much of our time on the river stalking sighted trout sipping these little bugs. Though not always easy, this type of fishing is extremely exciting, and its challenges make it all the more rewarding. 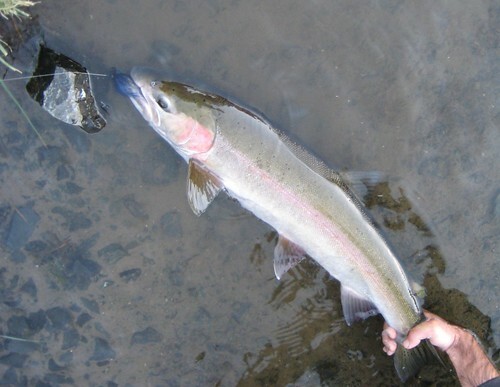 As summer slowly turns to autumn, the summer steelhead return to the river, migrating upstream toward their spawning grounds as they have for millenia. 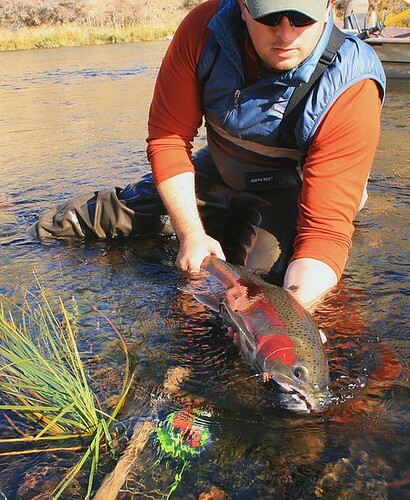 The Deschutes steelhead respond well to traditional down-and-across swung fly techniques. This time of year, we typically spend the bulk of our time swinging various wet flies, leeches, and the occasional skater. When you feel a steelhead grab your fly and the battle is joined, you will know why anglers come from around the world to chase these beautiful fish in this remarkable setting. Steelhead usually show up in good numbers on the section of the Deschutes we fish sometime in mid-September, and the steelhead fishing generally remains good here until the end of November when cooler weather drives all but the most die hard anglers from the river’s runs, pools, and tailouts. 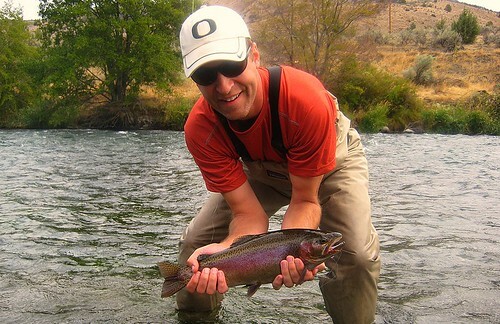 We offer trips on the Deschutes ranging from a one day float to a five day expedition. However, most of the trips we do on the Deschutes are three or four day overnight camping trips. This is the best way to see the river. On these longer trips we are able to access more remote stretches of the river with fewer people. The duration of the trip is a welcome respite from all annoyances of civilized life, and the fishing can be spectacular. We conduct all our trips out of safe and comfortable McKenzie style driftboats, each equipped with all the gear and amenities you might want to keep you safe and comfortable. The regulations on the Deschutes dictate that it is illegal to fish our of the boat. 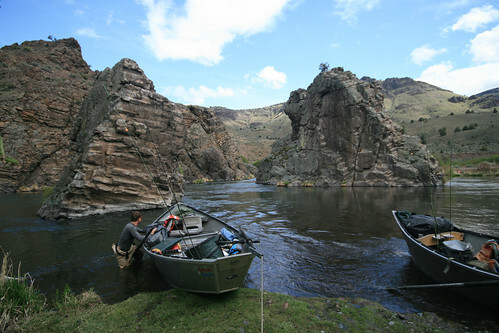 However, using the boat to travel from spot to spot allows us to fish otherwise inaccessible parts of the river, and is a quick and efficient means of travel so we can maximize the time you spend fishing productive water. Though the landscape is rugged, the accommodations are not. The meals we prepare are gourmet, hearty and delicious. We also provide spacious tents, as well as cots and sleeping pads to get a good night’s rest. We even have a hot shower, should you like to clean up after a day on the water. We provide dry bags for all your gear. We are also happy to furnish quality fishing tackle for you to use at no extra charge. Kyle, our trusted camp manager, takes all the gear and bags downstream to our chosen camp to set things up so that when we’ve made our last cast of the evening, the accomodations are set up, appetizers are on the table, the steaks are ready to go on the grill, and the cocktail table beckons. Most of the guests that come on these trips like them so much they become an annual tradition. The Deschutes is an extraordinary resource, and we do everything possible to make your experience of it the best it can be. 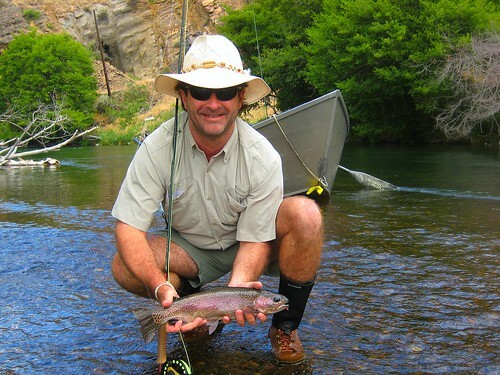 When it comes to providing a great flyfishing trip, there is no substitute for experience, and we have spent years on the Deschutes learning its secrets, making memories that will last a lifetime, and having a lot of fun on the way. All the guides we work with are seasoned professionals; expert boatmen and veteran casting instructors. Not only do we take you to the hottest fishing spots, but we also give you all the tips, advice, and coaching you want to raise your game to the next level, and to help you become a more effective angler. 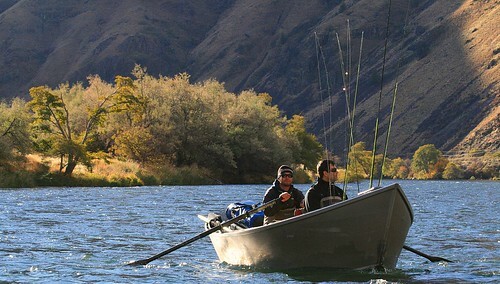 The fee for a one day trip on the Deschutes is $500 per boat, which accomodates 1 or 2 anglers. This includes tackle, should you like to use ours, flies and general fishing accoutrements, as well as non-alcoholic beverages and lunch. 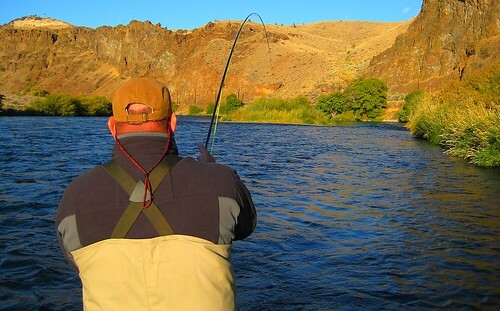 Overnight trips on the Deschutes, are $475 per person per day for groups of four anglers or more, and $525 per person per day for smaller groups. These rates includes tackle, flies and fishing accessories, all meals, and snacks. The rate is all-inclusive, with the exception of the shuttle for your vehicle ($65 each). I had such a great time on this trip the other weekend. 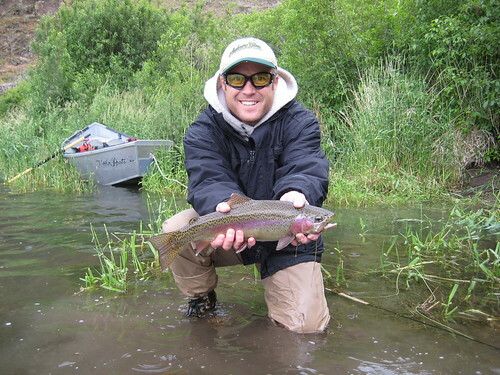 The guides are fantastic, food is great, and the fishing is amazing! I learned so much and had a blast. I recommend this trip to anyone who loves to be in the outdoors and especially all the fly fishers out there.